Firefighter Jeffrey Rhodes sprays inside a house on Classic Road that caught fire Wednesday. The building was already falling apart by the time fire crews arrived. It took the crew a few hours to completely put out all the flames because they couldn’t enter the structurally unsound building. 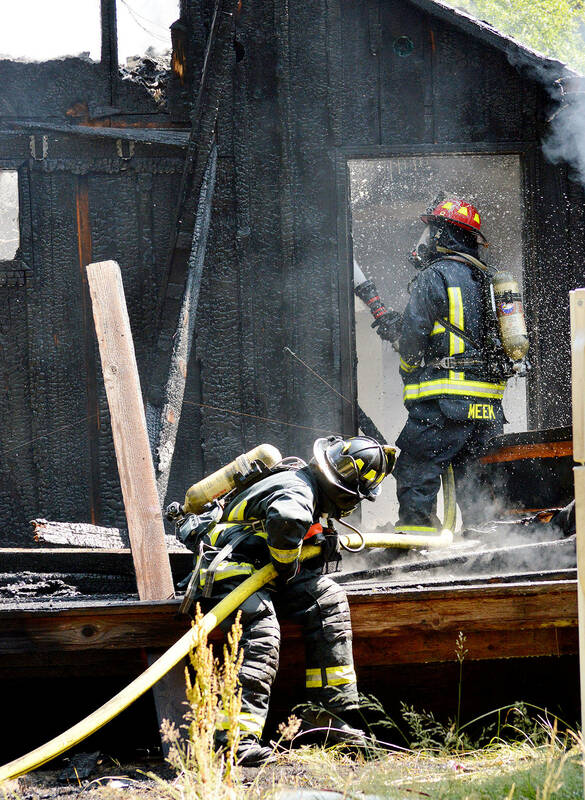 Officials from Central Whidbey Island Fire and Rescue say they are unable to determine the cause of a fire that destroyed an uninhabited house Wednesday. Firefighters from both Central Whidbey and South Whidbey Fire/EMS arrived at around 10:30 a.m. to find the building on Classic Road fully engulfed in flames, said Ed Hartin, fire chief for Central Whidbey. Although he couldn’t be sure how long, Hartin said the fire likely had been burning a while before it was called in. Upon arrival, firefighters found a portion of the back of the house had burned away, the roof had collapsed and flames were coming out the windows, he said. With how far the structure was set back among the tall trees, it would be difficult to notice the fire until there was a large column of smoke, Hartin said. Approximately 14 personnel with three engines and three water tenders responded, taking around 15 minutes to get the flames under control, he said. Fully extinguishing the fire took another nearly three hours because damage to the building made it structurally unsound. Debris continued to fall around them as firefighters worked from the outside to ensure all flames were put out. A nearby shed also sustained damage fire damage. Hartin said his “best guess” is that the fire started at the back of the house. There was no evidence someone was living in the building at the time of the fire, he said.